Have you acquired a stain on your carpeting, area rug or couch? Before applying a variety of solutions from bottles stored under your sink, call the carpet stain removal experts at Kentuckiana Carpet and Upholstery Cleaning LLC. Not all stains are the same, and not all solutions will work on them. Kentuckiana Carpet and Upholstery Cleaning LLC has been in the business of removing stains from area carpets for over 19 years, and we full understand the science behind stains and effective removal of them. Simply call (502) 935-2205 and describe the type and scope of your carpet stain, and we'll come out and help you with a solution. Stop! Before you use a commercial product that may damage your carpet or upholstery, call the experts at Kentuckiana Carpet and Upholstery Cleaning LLC. Stain removal is a science. The method required for your carpet or upholstery cleaning depends on the type of stain and the type of fabric. Coffee stains must be treated differently than blood stains. 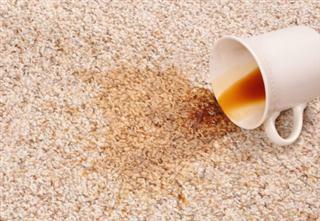 Certain stain solutions can actually damage your carpet fibers. Call the stain removal experts today at (502) 935-2205 for best results. While many furniture and carpeting fabrics are best cleaned by hot water extraction, others bleed and run when liquid cleaners are applied. These fabrics require special care. Whatever your carpet stain problems, you can count on the carpet and upholstery cleaning experts at Kentuckiana Carpet and Upholstery Cleaning LLC to fix the problem. You can rest assured that Kentuckiana Carpet and Upholstery Cleaning LLC technicians have the training and experience to remove the toughest stains and leave your carpet and upholstery smelling fresh and looking new again.